Clarks Shoes Advertisements - Do You Remember? It might not be impressive these days, but back in the 80's Clarks had the most high-tech advertisements around! A kid gets out of bed, puts on his shoes and he is transported to a strange computer land, like an old atari game, and defeats 'squared' monsters. Classic stuff! Do You Remember Clarks Shoes Advertisements? Trish, try utube, the advert may be on there. I also had a pair with a compass.When I got a new pair the next year they had a magnet,although I didnt realise this till I got home. 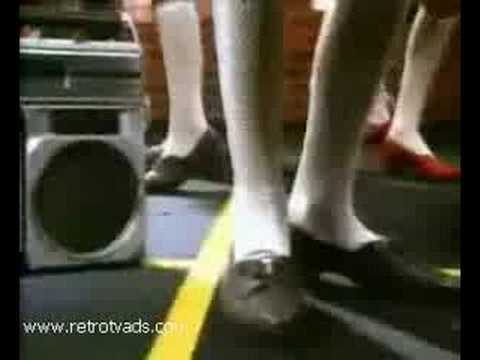 i had a pair of clarks hec tic toc shoes when i was 9, im 32 ow and still remember the add so well!! they were shocking pink suede with a game in the shoe sole!!!! I had a pair of wayfinder shoes but the compass fell out of the heel and made them really uncomfortable to wear. What a stupi place to keep a compass anyway! In the 70s they had an ad where someone drew a shoe onto a child's foot, and afterwards it turned into a rather smart pair of red patent shoes. I was forever scribbling on my feet after seeing that. I've just found out that the girl in the Magic Shoes ad is my girl friend Michele. I knew she'd done a few TV ad campaigns as a child but didn't realise what a child star she was. i remember the magic shoes, i had a pair when i was little, mine were white like the girl in the advert with the which who stole sunlight, i lived in them lolz.